LA Music: Live shows, new releases, studio life, and more. This Brooklyn, NY based indie synth duo stumbled across me on instagram, and directed me to their new single “Dreamers”. I followed their promptings, and was rewarded with a delightful style of music I haven’t heard since Broadway star Gavin Creel released his pop album Goodtimenation in 2006. 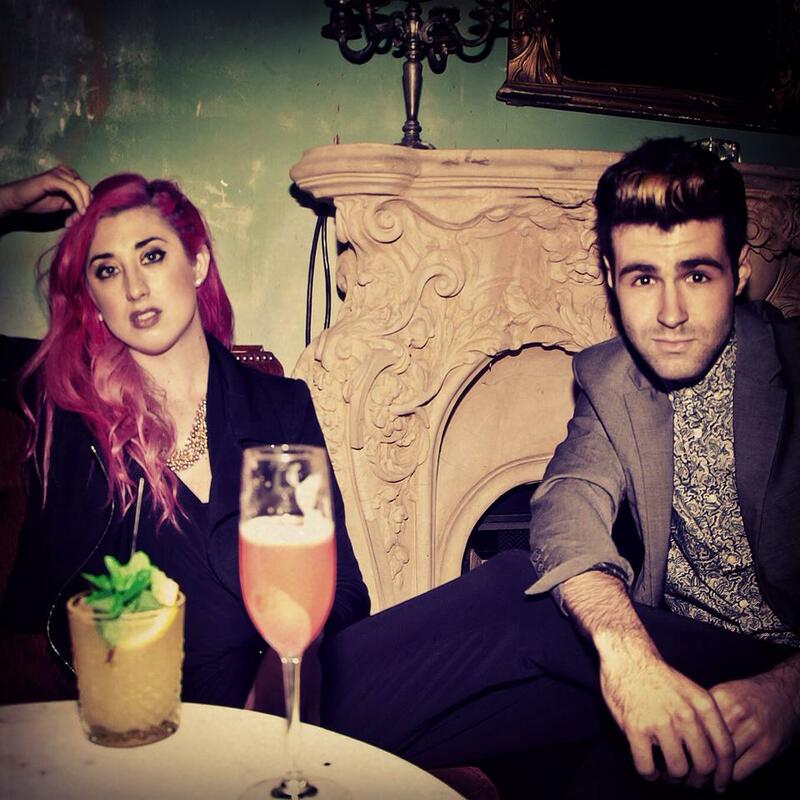 Villains in Love members Blake Charleton and Renae Adams bring similar theatrics and electronic elements to their new single, “Dreamers”, which will be released on iTunes on February 10th, 2015. The song, bringing romantic lyrics, peppy production, and powerful vocals to a mystifying point, is available for streaming on the duo’s soundcloud. “Dreamers” is playful, enticing, and a breath of fresh air that deviates from today’s mainstream sounds, while still adhering to enough modern influences to feel relevant. The fresh production and theatrical elements make the song distinctly NYC, and this indie synth Karmin can be experienced at such Manhattan venues as Rockwood Music Hall and Mercury Lounge. Follow them on instagram (@villainsinlove) to stay up to date on upcoming shows, their EP release (coming spring 2015), their album release (slated for fall 2015), and of course, head to iTunes and purchase “Dreamers” on February 10th, 2015. Drea Dorman is a singer-songwriter and music blogger living in Los Angeles, CA. Learn more about Drea and her music at www.dreaofficialmusic.com. The Mint served up a special treat on Wednesday night, with the indie pop duo Suddenly Boy N Girl. Comprised of Anthony Pepi and Candice Kelly, both graduates of the Berklee College of Music, the duo is an unlikely pair, to say the least. First, there’s Anthony, with his boy next door look and nostalgic vocals, reminiscent of the garage band front men who ruled the airwaves for the better part of the early 2000s. Beside him stands Candice, with her fearless punk rock princess attire and rich, tantalizing vocals. Together, they bring a musical balance so interesting, the audience can’t help but be enthralled. The duo started their set with an original, “Beautiful Strangers”, which had been penned for a documentary. Anthony stood on keys, with both Anthony and Candice on vocals; an excellent guitarist brought the percussive elements to the acoustic set. As Suddenly Boy N Girl reeled us in further to their set, it became clear that the two made a powerful songwriting team, with catchy and unique melodies filling the ears and hearts of the show attendees. From the stunning acoustic cover of Clean Bandit’s “Rather Be” to the performance of their debut single “Something More”, the pair proved they were worth their salt. The juxtaposition between Anthony’s flawless falsetto and Candice’s irresistible vocal additions made for an intriguing and balanced composition. Anthony brought color where Candice brought class; both brought their own excellent skill set to the table, and revealed their hand to be a royal flush. The duo has hit the ground running in 2015, with a performance at Hollywood’s Pour Vous, now the Mint LA, and an upcoming performance at House of Blues Anaheim at Downtown Disney on February 22nd. Keep an eye out for this eccentric and talented indie pop duo, as they continue to pound the pavement in the top Los Angeles venues. Songwriter Sundays April 28, 2019 at 8:00 PM – 12:00 AM Fox & Hounds Pub, 11100 Ventura Boulevard, Studio City, CA 91604, United States No cover, all ages, free parking!